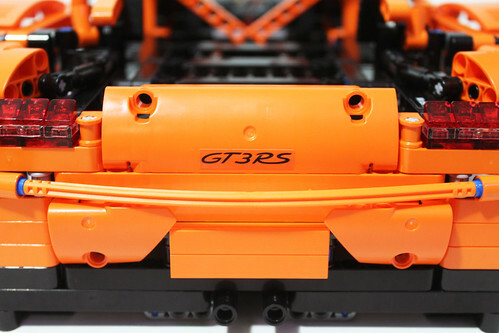 Back in January of this year at the 2016 London Toy Fair, there were some details of the new LEGO Technic Porsche 911 GT3 RS (42056) and at the Nuremberg Toy Fair, we got our first look at it. 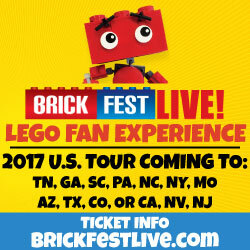 LEGO fans and car enthusiasts alike were excited for the set and just last month, it was officially announced. 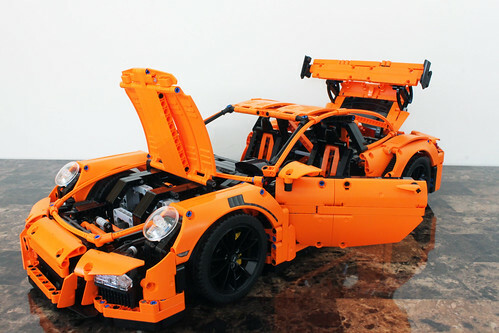 The Porsche 911 GT3 RS (42056) consists of 2,704 pieces and retails for $299.99. 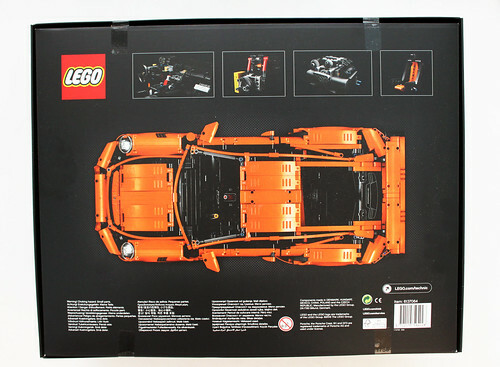 Since this is a direct-to-consumer set with a partnership with Porsche, there’s definitely a premium feel to the box and the amount of attention given to the set overall from the box to the build itself. 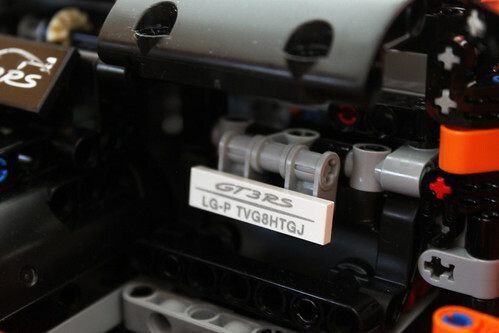 Fair warning, I do not build much LEGO Technic so I’m not totally familiar with all the terminology. Speaking of the box, I normally don’t review the boxes but this one deserves it. It is made out of a matte material and it is massive. The front is simple with it showing off the Porsche 911 GT3 RS in front of a carbon fiber background. 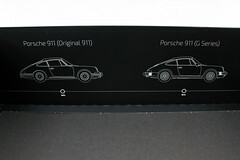 It also shows that the set is in 1:8 scale of the real-life car. 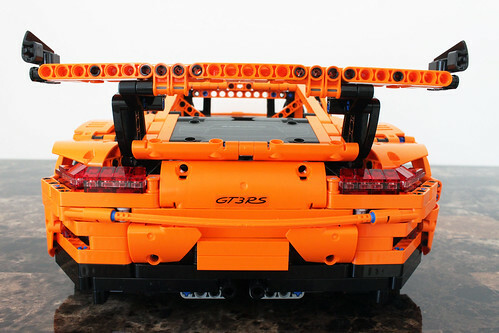 The back shows some of the details of the Porsche 911 GT3 RS which I’ll get to later. 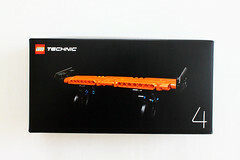 When you take off the cover, you have a different look than your standard LEGO set. Instead of all the bags thrown in with the instructions, you get five boxes neatly packed with the rims down the left side and the instructions in the middle. 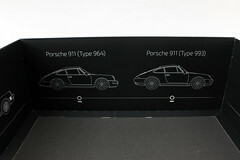 The inside of the box cover shows a timeline that features the evolution of the Porsche 911 from the Original 911 classic series back in 1963 to the Type 991 series in 2011. 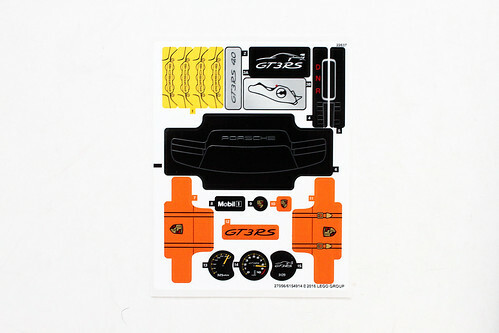 There’s also a small sticker sheet which adds a little more details to the Porsche 911 GT3 RS. 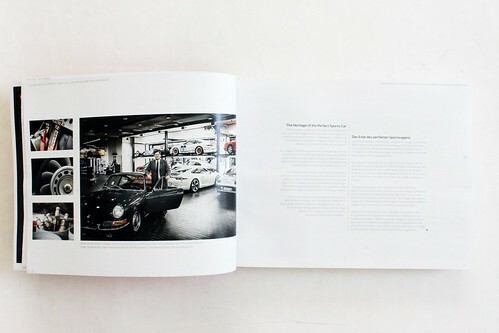 The instruction booklet can might as well double up as a coffee table book. 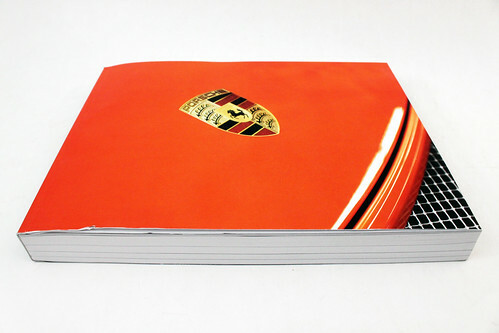 The front cover shows the Porsche emblem and has a very minimalistic design. 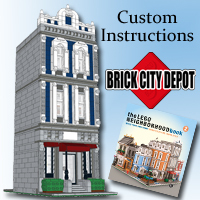 It contains 580 pages because it counts the covers as a page and there are a whopping 856 steps to the build. 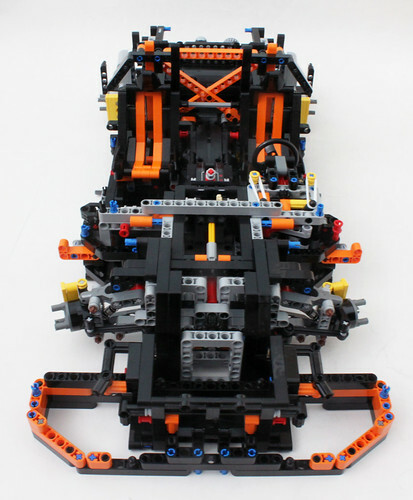 The introduction page gives you a short description of what LEGO Technic is about. 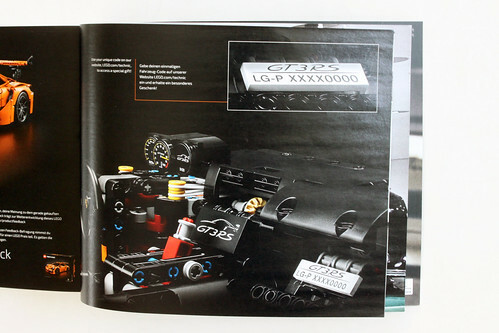 The following pages give you a history of the Porsche 911 and how The LEGO Group decided to produce this set. There’s also a cool timeline showing the development process of this set which started in winter 2013 with the initial concept to the final approval from the Director of Porsche/Head of GT Cars AG Andreas Preuninger and his team in autumn 2015. 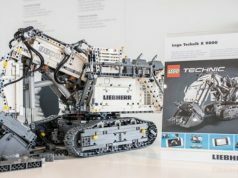 Finally, there are interviews with LEGO Designer Uwe Wabra and Porsche Vice President of Motorsport and GT Cars Dr. Frank-Steffen Walliser. 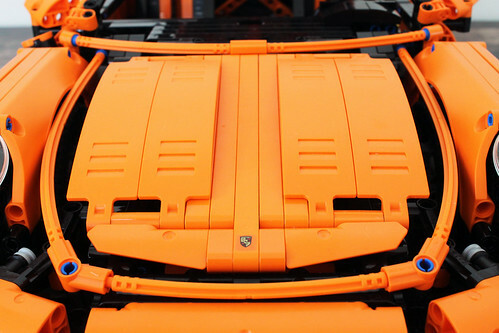 The first box takes you though 323 steps worth of creating the base frame of the Porsche 911 GT3 RS including the PDK dual clutch gear box (Porsche Doppelkupplung). 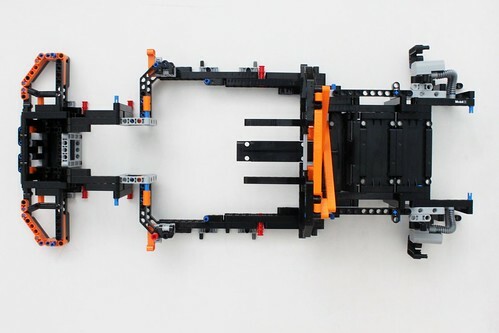 As you can see, there’s the drivetrain running through the middle of the chassis connected with all the gears to the 4.0 flat-6 engine in the back. 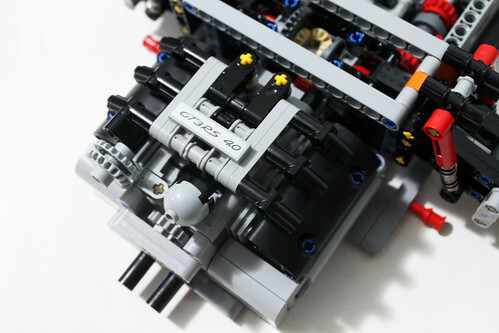 The engine itself also has moving pistons as the gears are going. When you get to about step 100, a majority of the gears are in place and you can just see how much work was put in to design the working gears. 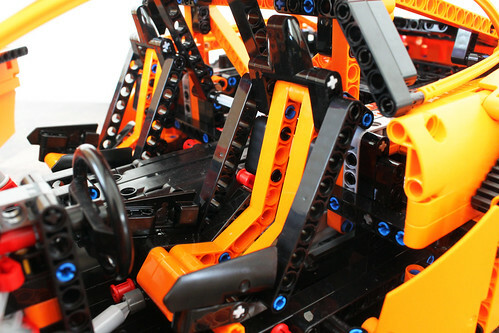 Next up is the steering column with the working paddle shifters. 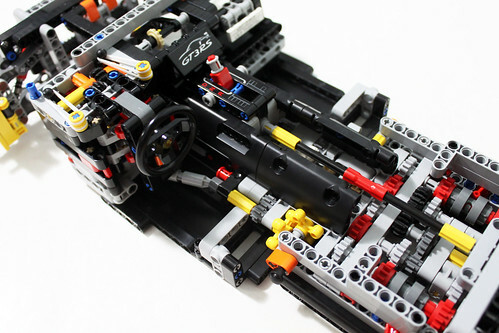 In the middle of the steering wheel, you do have a stickered 1×1 round tile of the Porsche logo. 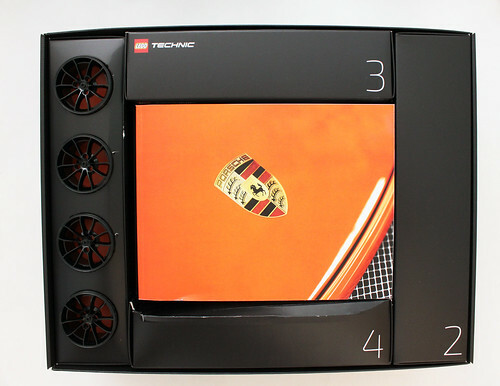 Next to that, you have a stickered 2×4 tile of the the touchscreen for the Porsche Communication Management (PCM) control center of the center console. 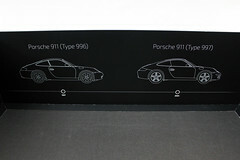 There’s also another sticker that you could use with just the map of the Weissach Development Centre. The downside here is that there is only one 2×4 tile so you’ll need to find another one to use both stickers. 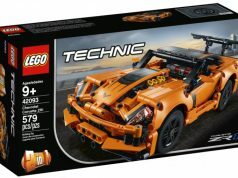 Following that, you have the glove compartment which has a unique serial number that you can enter at http://www.lego.com/technic to access a special gift. 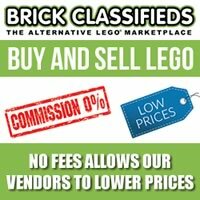 As of this post, the page to enter the serial number is not live yet. 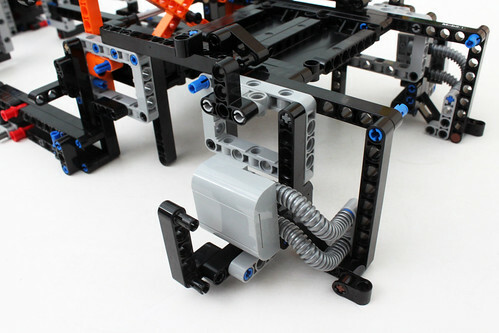 The final parts of Box 1 include building the front wheel axles which connect to the steering column. 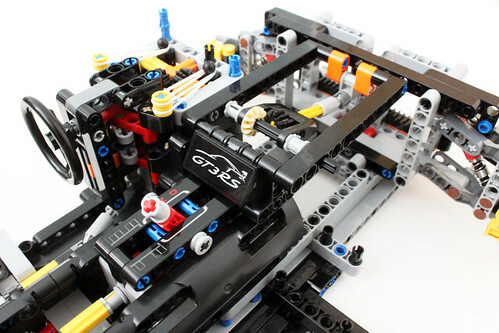 You also create the rear wheel axles as well. Both of these include little details that make the stand out more such as the signature red double suspension springs as well as the yellow brake calipers which represents the Porsche Ceramic Composite Brakes (PCCB). The last build of the box is the 4.0 flat-6 engine with moving pistons as the car is rolling. Again, this works perfectly because of the highly detailed gear building at the beginning. The only issue is that the panels that you’ll be building later on will cover it up so you won’t even see it. 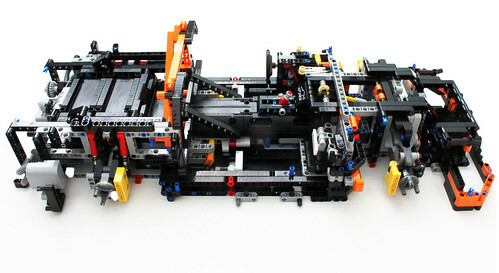 Some have pointed out that there’s an issue with the instructions on steps 267-269 as the gears are in the wrong order. 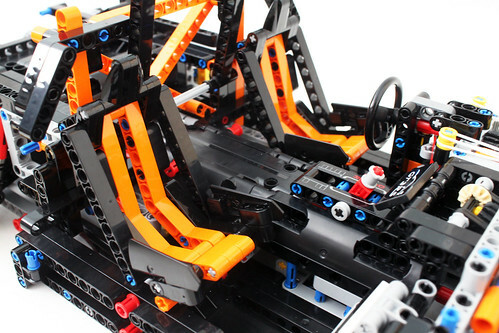 You’ll want to have the smaller 12-tooth gear in first then the 20-tooth and finally the 16-tooth. If you want it to shift correctly, you’ll want to do this before you move on or you’ll have to take apart a lot to get back to this step. 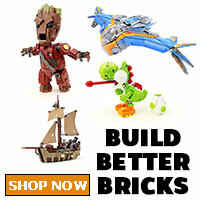 However, LEGO has issued a statement that both ways are correct so its up to you to decide which way works best for you. 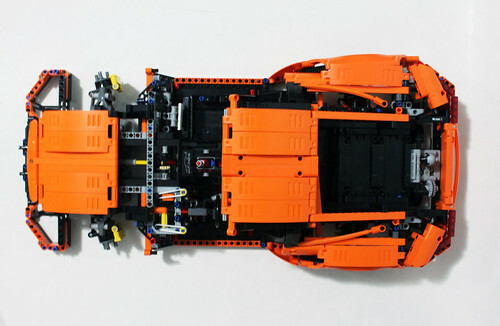 I guessimate the conclusion of Box 1 for the Porsche 911 GT3 RS takes up about 40-45% of the parts for the set because as you see, it is already pretty massive. 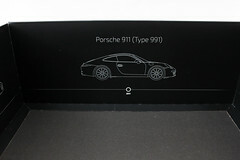 Box 2 starts with you creating the car frame for the Porsche 911 GT3 RS. 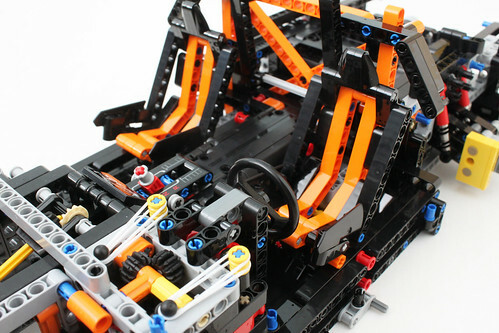 This part of the build gives you a rough shape of the car with the front bumpers, the area for the hood, and the part to stabilize the roof, as well as the roll cage behind the seats. 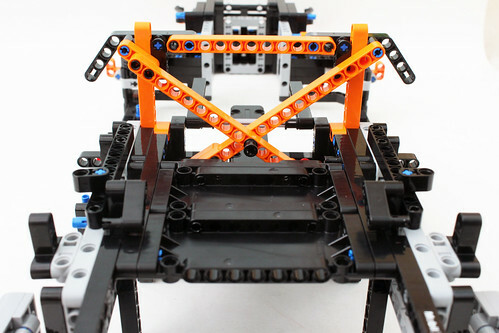 The whole frame is connected to the drivetrain by the way of pins throughout the car. This whole area takes up roughly 95% of the parts in the box. 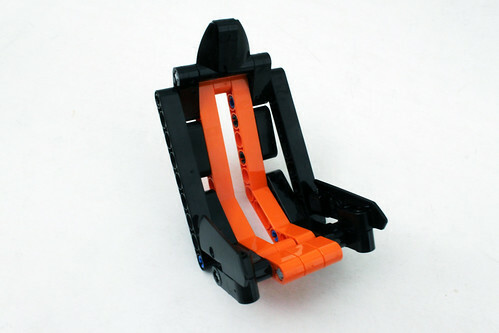 The rest of the parts are used for the creation of the racing seats for both the driver side and the passenger side. I do like the part where the “marriage” as Porsche calls it where you put the frame on top of the drivetrain. 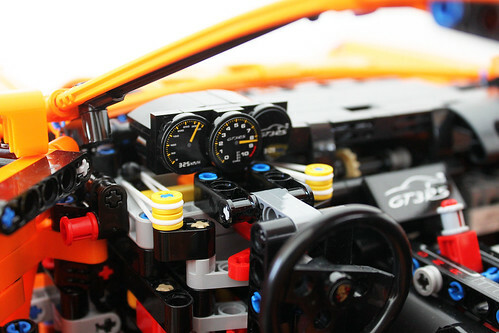 It gives a feeling of actually building a car. After everything is all connected, we have reached Box 3 of the set. 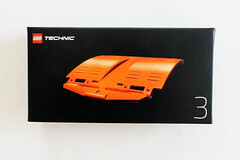 For this box, a lot of the rear bodywork for the Porsche will be assembled. This includes the wheel arches above the rear wheels as well as the rear bumper. The back panel has a sticker for the GT3 RS logo on it. 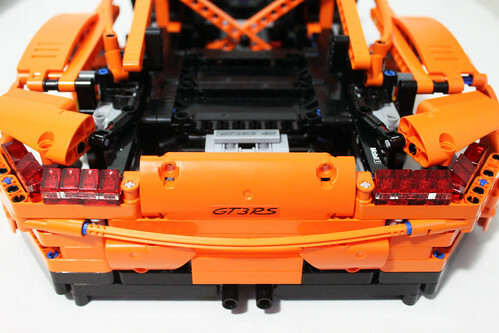 Also in the back, you create the rear lights which consists of trans-red and trans-clear pieces. 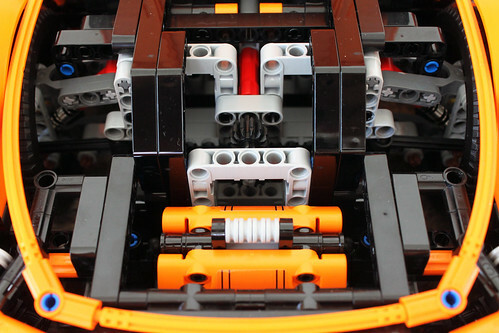 One thing that I was pretty impressed with was how LEGO created the roof outline using the exclusive orange flex tubes on the sides and how smoothly it comes out at the end. The hood is next and it’s pretty simple using the the various panel pieces. 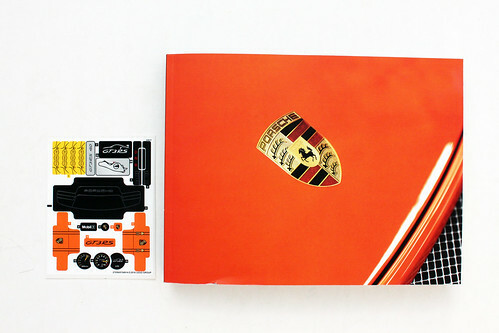 It’s also worth mentioning that there’s a little sticker of the Porsche logo in the center. Finally, the roof is created using the same panel pieces as from the hood. They are locked into place using some 9M black and 15M orange beams. 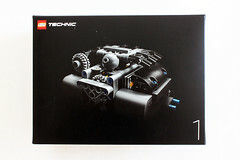 Boxes 4 and 5 are the last boxes for the LEGO Technic Porsche 911 GT3 RS (42056). You start by building the air vents and panel in front of the hood. Next up are the front wheel arches which includes printed pieces. It is similar to the rear ones except these have room for the headlights as well. 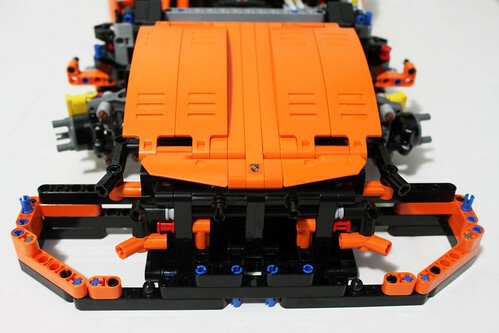 The next to last parts of the build are the movable rear spoiler and the doors. 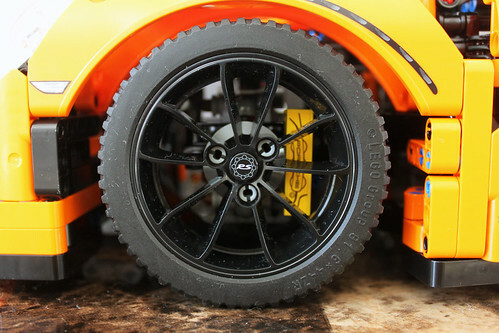 The exclusive rims and wheels are added on next to complete the final look of the Porsche 911 GT3 RS. One thing to note is that the rims are custom designed for the set. 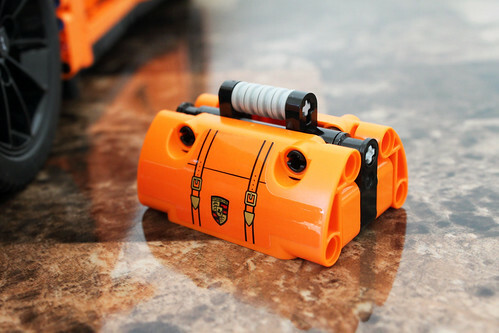 The last thing to build is an accessory to the car with the suitcase that is held inside the trunk in the front. 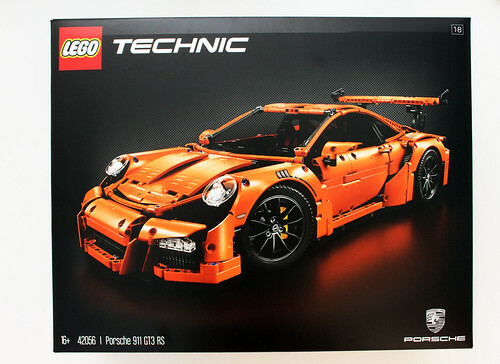 Considering that the LEGO Technic Porsche 911 GT3 RS (42056) is my first Technic build and review, I am thoroughly impressed with it. One word of caution, make sure you follow the steps or else you’ll be regretting it later on. 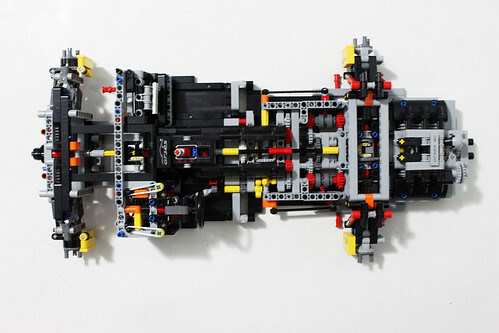 Because these aren’t your typical LEGO builds with the bricks, you can’t just easily take it apart and put it back together. Let’s just say I’ve learned my lesson on that. 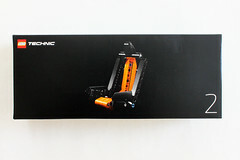 Of course, you can modify it to add Power Functions to it but I’m not qualifed enough to speak about that. In the end, it took me roughly around 10 hours spread out a couple days to complete. I also do appreciate the amount of detail put in for the packaging to give it a more premium feel. Even the individual boxes for the bags were a nice touch as well. As I said before, the instruction booklet is fantastic as well. 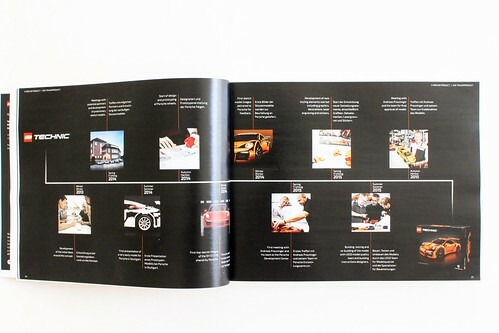 There’s lots of information about the Porsche GT3 RS and I especially liked the timeline of the set creation. 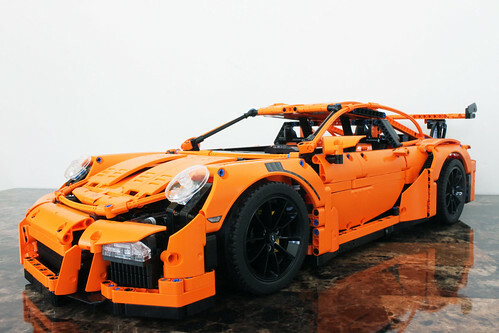 The overall design of the Porsche 911 GT3 RS itself is very nicely done as well as the orange color scheme although it would’ve looked cooler with the black and white camo deco that was shown at the toy fair. It’s appropriately scaled and is way much larger than I expected. 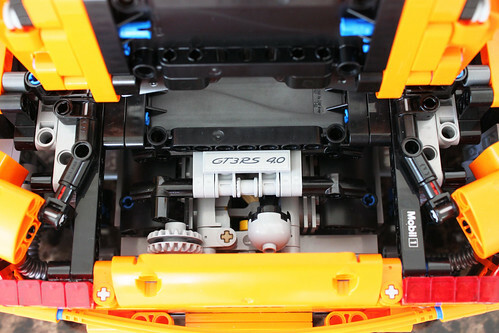 The features are well done as well such as the gearbox and the moving pistons on the engine however there’s that issue with the instructions. There’s also subtle details throughout the car that makes fans appreciate it more like the laser engraved serial number tile in the glove compartment area. 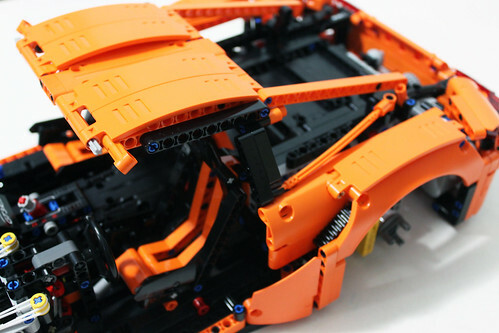 If you’re looking for a set that will impress you with the design and building experience, the LEGO Technic Porsche 911 GT3 RS (42056) is a great candidate. The only main deterrent may be the price of the set as it does come in at $299.99 which may be a tough pill to swallow especially if there’s no good promotions going on. If you decide to wait on it, the fall/winter Double VIP event may be the best time to pick it up.